IB French tutor online. Preparation for Ab Initio, B SL, B HL. Experienced native French tutor. Private class via Skype from $15/hour. Try it FREE. Learn from home with our online course via Skype on days and time of your convenience. Our IB French tutor online is available for lessons in the morning, afternoon, evening and even night time. We teach 24 hours a day, 7 days a week! 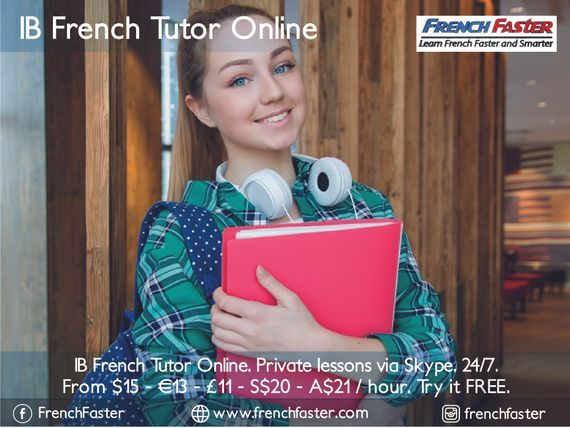 Why choose an IB French Tutor Online from French Faster? Short learning period: Our IB French Tutor Online uses an accelerated learning approach that builds on your knowledge of English to help you learn French faster and smarter! Some students who didn't do well at school could score A after learning with us. Experienced bilingual tutors: You learn from an IB French Tutor Online (all native speakers) who know exactly what to do to help you score well in the IB French exams: IB French Ab Initio, IB French B SL or IB French B HL. Latest exam questions: Our IB French Tutor Online will provide model answers for recent and past IB French exam questions, apart from our own bank of mock questions. Excellent learning materials: You wouldn't need to buy any extra learning materials; our IB French Tutor Online provides all pdf and audio files. Anytime, anywhere: You can take the class online via Skype anytime, anywhere; our IB French Tutor Online is available 24 hours a day, 7 days a week! Guaranteed Success: So far, we have a 100% success rate. The program is delivered online with a private tutor. It is not pre-recorded video lessons. Our IB French tutor online is a qualified native French speakers who are bilingual in French and English. Our IB French tutor online is experienced teaching the IB French programme. Our IB French tutor online uses our Accelerated Learning method for faster progress. Our IB French tutor is entitled to a 5 min break after every 55 min of classes. We send you the IB French learning materials (pdf documents) before the lesson. The IB French lessons are specifically designed for online learning. You can sign up for our free trial lesson (25 minutes). This is delivered as a private lesson with the teacher online. We need a minimum 2-3 days advance notice. My son Avinash was studying in IB Year 1 when he needed some help with French Ab Initio his SL subject. Then we came across Rozeedah a French teacher from French Faster ... a great tutor and a wonderful person. She guided my son through his difficulties in French Ab Initio and he gained confidence. His performance improved under her patient guidance. and secured a place in an esteemed University in Singapore.